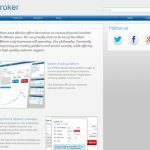 1Broker is a unique Bitcoin-dedicated platform that allows Bitcoin users to experience the professional-vibe of online forex trading. Forex brokers exclusively for Bitcoin is rare in today’s market, hence having 1Broker around is such a relief for Bitcoin traders. This platform entered the market in 2012. It became one of the pioneering brands that have introduced the idea of online trading solely for cryptocurrency, and it continues to offer Bitcoin forex services until this review is written. 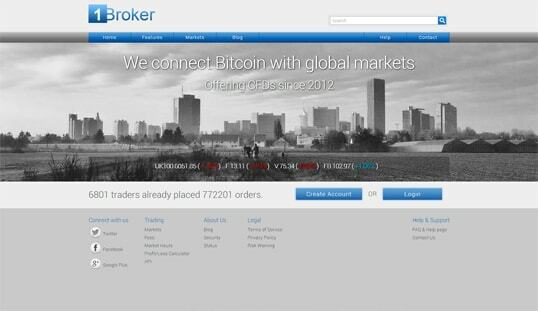 1Broker is known to offer the exact same features seen on the conventional online trading platforms. Traders are provided with a wide spectrum of markets, indices, commodities, forex, and stocks they can opt to invest in. Bitcoin traders can trade and predict the outcome of major corporations in the world like Apple, Microsoft, Google, as well as on currency pairs of USD, JPY, NOK, CNH, and a lot more. Not to mention, 1Broker is among the few to offer trading markets such as an impressive roster of indices and allow trading and investing for cryptocurrency. Its services go on par with the conventional setup of online trading. This eventually topples down the barrier that hinders the advance and progress of Bitcoin to the mainstream market. More importantly, the BTC/USD pair is on board too. 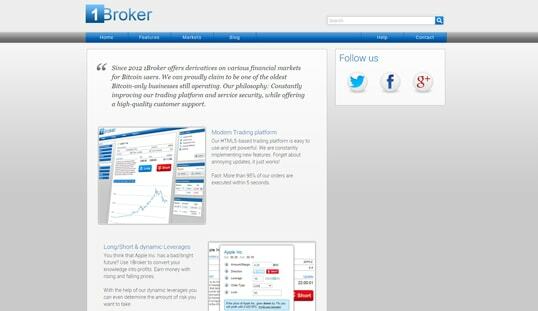 One of the positive points of 1Broker is its simplified graphics and interface. 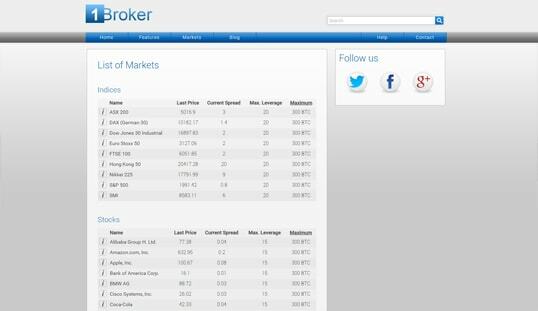 Compared to most online trading websites, this website does not have too much clutter. Instead, the minimalist design is emphasized, making it look more professional. 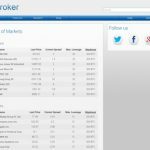 To top it all off, the 1Broker website is extremely easy to navigate that even novice traders are to become experts in no time. It is HTML5-based, offers long/short and dynamic leverages, configured in Bitcoin, and is protected by intense security. Creating an account is quick since only the username, password, and an email address are needed. This platform is built on Bitcoin technology, so anonymity is observed. Likewise, fund management can be done instantly and smoothly here on 1Broker. Once logged in, players just have to navigate through the right corner of the page and locate the Cash Balance section where the ‘Deposit’ and ‘Withdrawal’ tab can be seen. Should they wish to conduct any of the following will just have to select its command button. There are no fees when depositing bitcoins, but 0.001 BTC will be charged to every Bitcoin withdrawal. 1Broker aims to ensure email assistance with 24 hours of inquiry, but traders are advised of longer response time during weekends. Email support is the only means to reach assistance; having live chat support would make the platform more convenient.